Our Essential EMail Business Plan gives your 100+ users impressive webmail, mobile connectivity, anti-spam and other features. 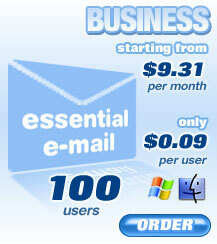 Best of all, it includes a new mobile webmail client designed exclusively for smartphones and tablets. Click here for more info.